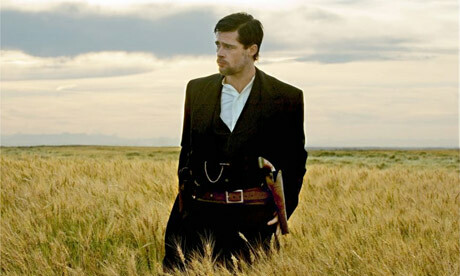 The Assassination of Jesse James by the Coward Robert Ford (2007): What a remarkable film about one of our nation's first iconic celebrities! This has the best cinematography of 2007--just watch the train robbery scene near the beginning and be floored--and one of the best character studies on identity formation found in film. The film's uber-long title describes the basic premise--legendary Jesse James was assassinated by the cowardly cretin, Bob Ford. But the film is really about the mythic legend of Jesse James, a man who was larger than life in the eyes of the public, yet still a man with human struggles and ambitions. Throughout the film, we see James (embodied by a current cultural icon, Brad Pitt) in iconic poses, staring off into the distance thoughtfully, making witty remarks, playing up his larger-than-life image. James seems to find his identity not in who he wants to be, but in who the public perceives him to be. This is most clearly seen in his relationship with Bob Ford, a pathetic adolescent with big ambitions. Ford idolizes James at the beginning of the film, seeing James almost as a mythic hero or Greek god. He finds his own identity in his relationship with James--the closer he comes to James, the more he seems to come alive. But when James ridicules and mocks him, the dream is shattered, the idol-worship identity destroyed. Ford is left with the twisted desire to attempt to become a god himself via the assassination of his own idol, possibly in an attempt to replace James with his own fame. While most people likely view Ford with hatred for being so pathetic and gutless, I viewed him with pity and despair. He reminded me of a lost adolescent--a junior higher--struggling to find his own identity in relation with the "ideal" personified by James. It was so interesting to watch both James and Ford form their identities based on the scripts that society had handed them. There are so many parallel relationships throughout history, the most significant being the betrayal of Jesus by Judas Iscariot. Overall, a slow-paced but haunting film. (8 out of 10). Four Weddings and a Funeral (1994): I have been meaning to see this early 90s Best Picture nominee for a long time now, so I went in with some high expectations. Sadly, my expectations were not met. Perhaps comedy was different in the early 90s than it is today. Or perhaps Hugh Grant had not quite come into his own yet, and was still relying on awkward stuttering and incessant blinking instead of witty dialogue. The film follows a group of single Brits as they go to four weddings and (surprise!) a funeral. Grant's romantic attraction is to an American, Andie MacDowell, whom he meets at the first wedding. To be honest, there just wasn't much chemistry from MacDowell for much of the movie--she seemed more like a shallow-but-pretty face than someone truly worth falling in love with. It did have its funny moments, but much of the comedy sadly relies on awkward sexual dialogue or situations. Not sure I can recommend it; there are much better Hugh Grant romantic comedies out there. (5 out of 10). The Thin Red Line (1998): Directed by Terence Malick, this is one the best films I've ever seen. This is a beautiful World War II film that was greatly overshadowed by being released the same year as Saving Private Ryan. The first time I watched this was during high school; my good friend Joe fell asleep on my couch while I watched for the entire 3 hours, absolutely fascinated with the depth of the characters and insights. Seeing it again on the same day as The Assassination of Jesse James was a visual treat, as both films have extraordinary cinematography. I'll write more about this film in an upcoming top war films list. For now, just know that this is one of my all-time favorites! (10 out of 10). How did you post this at 6 am? is that eastern time? because its not 6 am yet where you live. Maybe im just really stupid though. Im sitting at work and yes I have nothing else to do but make stupid comments regarding what time you write on your blog. Word. I actually posted this last night, but put in the post time as 6 AM this morning. I bend time and space too. Have fun at work!